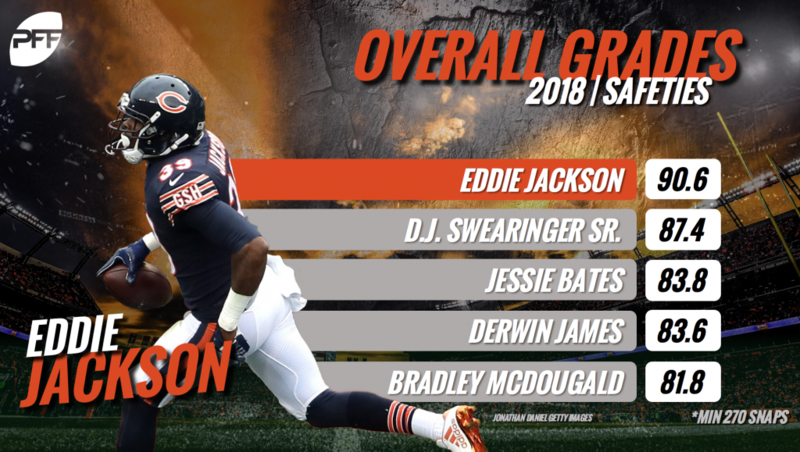 The Chicago Bears currently rank as PFF’s highest-graded overall defense at 91.5 this season, and the emergence of safety Eddie Jackson in his second season is a major reason why. Jackson has been exceptional thus far, ranking as the highest-graded overall safety through nine weeks. He’s also coming off, arguably, his best game of the year. Against the Buffalo Bills in Week 9, Jackson earned a spot on PFF’s NFL Team of the Week in a performance against the Bills where the second-year safety generated a season-high four defensive stops and allowed only four yards in coverage. He also has a strip, fumble recovery and rumble for a touchdown. His 93.4 overall grade for the week ranked first among safeties and first overall among NFL defenders. A product of their highest-graded defense, the Bears’ rank first in run defense and coverage grades at 92.6 in both categories. Jackson has made a considerable jump from his 2017 season as a balanced defender against the run and the pass through the first nine weeks. Last season, Jackson ranked 66th with a run-defense grade of 63.1, chipping in only 10 stops in 411 snaps against the run. The sophomore safety has already contributed four run stops this season, and his run-defense grade is more than 20 points higher thus far at 85.7– good for first among safeties. Jackson has also been particularly great against the pass this season. Since Week 1 against the Green Bay Packers, Jackson has allowed only 11 receptions for 54 yards when targeted in coverage. During that span, Jackson has generated two interceptions, one pass breakup, nine defensive stops and has limited opposing receivers to only 12 yards after the catch. As a result of his shutdown ability, his coverage grade of 89.8 is the highest at the position by almost five points through Week 9. Jackson’s sophomore leap from his rookie season has been a pleasant surprise for a Bears’ defense that has been trending in the right direction since last season. With Adrian Amos Jr.’s emergence a season ago and continued top-tier play through Week 9 (79.9 overall grade), the duo has combined to form one of the most formidable tandems at safety in the NFL. As All-Pro defensive end Khalil Mack works his way back from injury and the Bears’ front seven continues their dominance of the line of scrimmage, PFF’s highest-graded overall defense is getting scarier for opposing offenses as we head into the stretch run of the NFL season.